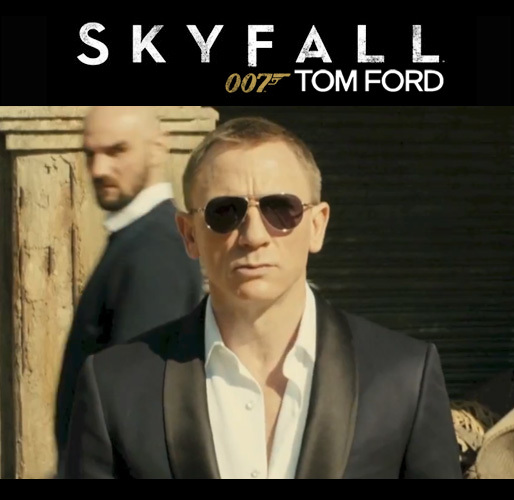 James Bond 007 (Daniel Craig) wears the Tom Ford Marko sunglasses in Skyfall. Set to hit US theaters this Friday, Daniel Craig is back as James Bond 007 in ‘ Skyfall ‘. Once again the world’s favorite secret agent gets styled by designer Tom Ford, from his impeccable tailored suits to his sunglasses. Worn both on set and in the film, James Bond wears the Tom Ford Marko sunglasses, from Tom Ford’s latest range. The Marko is a classic aviator style with a modern line and subtle detailing. Available in four colors, on screen he wears the silver frame with smoke blue lenses. Some fans might recall this is the same color combination as the now collectable Tom Ford 108 sunglasses he wore in the previous Bond film ‘Quantum of Solace’.